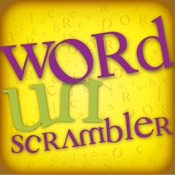 Quickly unscramble words and phrases from any word jumble or scramble puzzle such as Scrabblẹ or Words With Friends. Just enter the scrambled letters and the app will find all the possible full or partial word matches. You can enter multiple scrambled words at a time. You can also use a question mark (?) character in your scrambled input to represent a wildcard or blank tile. Send questions and feedback to: apps-ios@audama.com.